Physicians have topped this year’s list of the 25 highest-paying jobs in America. In the latest report by jobs marketplace Glassdoor released on Wednesday, physicians are expected to bring home a median base salary of $180,000, which is highest among all occupations. Lawyers and research and development managers fill out the top three. One common thread that unites the top-paying jobs is the high level of skill required, and the protection of these jobs from any threat of automation. “This report reinforces that high pay continues to be tied to in-demand skills, higher education and working in jobs that are protected from competition or automation,” said Dr. Andrew Chamberlain, Glassdoor chief economist, in a statement. 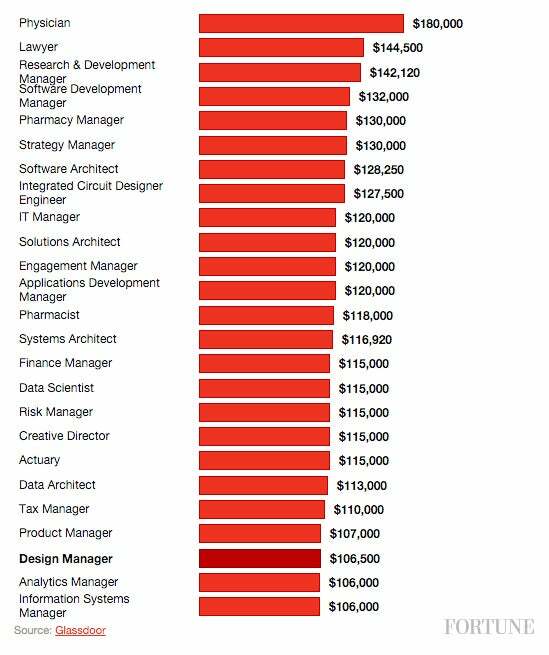 The tech and healthcare sector are especially well-represented in the list, with eight of the top ten-paying jobs going to either of those two sectors. “The urgency of many healthcare scenarios requires snap-decisions or creative solutions to existing medical conditions,” Chamberlain said, as reported by 24/7 Wall St. Both sectors also feature heavily in our latest 100 Best Companies to Work For rankings. It also pays to be a manager -- 15 of the top 25-paying jobs are managerial in nature. “The manager skill set that requires maintaining a working team in a fast-paced, highly-educated industry like tech, finance or healthcare is also something that employers find difficult to automate, and will invest in with higher employee salaries,” Chamberlain told 24/7 Wall St. The thought that robots could become our biggest competition for jobs is also reflected in Glassdoor’s list of lowest-paying jobs, which were filled by servers, receptionists and leasing consultants respectively. This follows a recent report by the World Economic Forum that estimated a net employment loss of 5.1 million jobs by 2020 due to technological change.